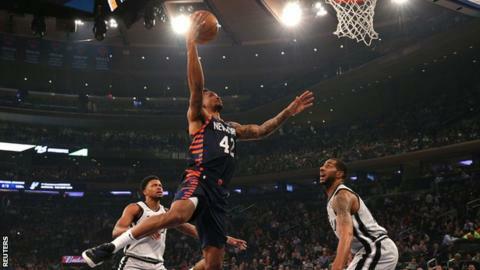 New York Knicks ended their 18-game home losing streak with a 130-118 win against the San Antonio Spurs. They had come within one defeat of tying the NBA record for the longest home losing streak set by the Dallas Mavericks in the 1993-94 season. Before Sunday, the Knicks' last victory at Madison Square Garden was on 1 December. The win was mentioned by actor Samuel Jackson before he presented an Oscar to Knicks fan and film director Spike Lee. "The Knicks won tonight. I repeat, the Knicks won tonight," Jackson said to Lee at the Academy Awards in Hollywood. Lee won Best Adapted Screenplay for BlacKkKlansman.